I went to South Africa specifically to go on safari. The amazing trip to Cape Town was just an extremely awesome extra that I feel lucky to have experienced. Anyway, back to Safaris. 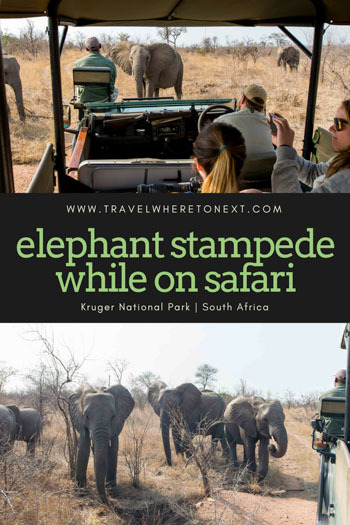 I researched for hours and days on end trying to figure out where to stay and how exactly to safari while I was there. Self-drive or luxury? Luxury or ULTIMATE luxury? How many days, how many hours, where to drive? All these questions came up and it's a huge reason I wrote a LONG article on Kruger. Find it here. It is also why I choose to do both. I wish I would have known that I really didn't have to worry so much. 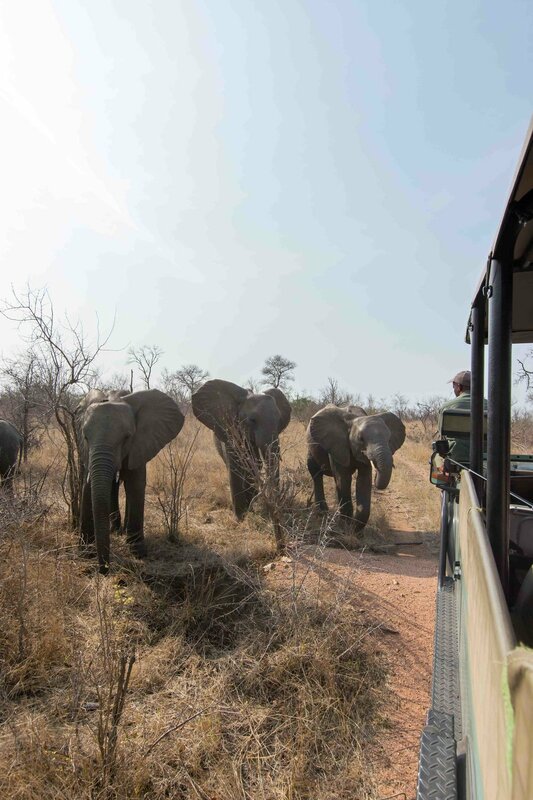 While on safari I got stampeded by a herd of elephants. And not once, but twice. Seriously. You probably are automatically thinking, oh ok, so you got too close to an elephant while self-driving and they got a little mad and took a couple steps towards you. So, we are driving along with our guide at Lukimbi. It's a beautiful morning drive and we have already tracked a pride of lions. Seriously, so cool. We round a corner and there are around 20 elephants grazing in the middle of the road. 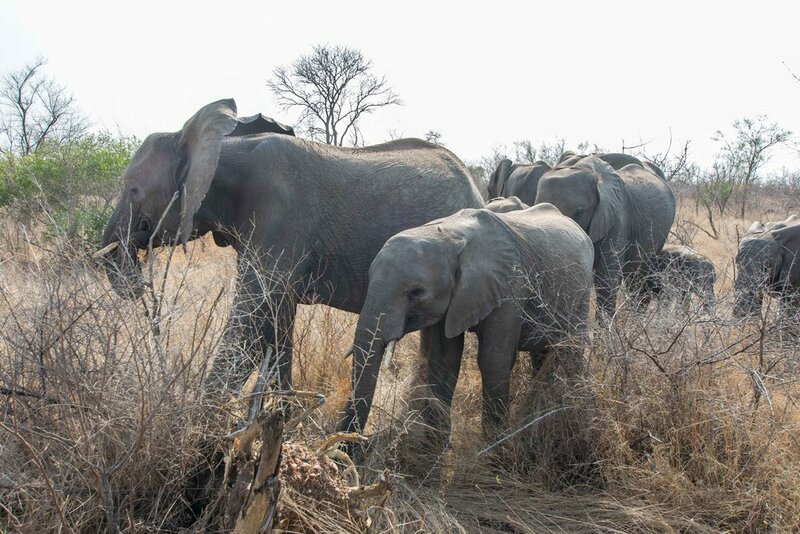 The herd has two small baby elephants as well as some juveniles. There is one huge matriarch of the herd and she is staring at us while the others pay us no mind. Our guide slowly rolls to a stop and turns of the engine. Us guests are none the wiser of the immediate danger. We all are hanging out, taking pictures, and just generally so happy to be THIS CLOSE to so many elephants. After about five minutes of sitting, our guide turns the car back on to leave. The mother matriarch does NOT like this and she runs to the car with her ears as wide as possible and lets out a small trumpet. We all slide to the far side of the car (as if that would do anything) and our guide shuts off the car and immediately starts speaking to the mother in one of the African dialects. This is him you hear in the video. After a couple of tense minutes, she lowers her ears and backs away a couple of steps. But, she doesn't take her eyes off of us. Our guide explains that this elephant doesn't like cars and most likely had a bad run-in with poachers at some point. She is very protective of her herd, especially since there are two little ones at the moment. He explains that just last week she ran after his car for almost 100 meters (the length of a football field) just for driving too close to her herd. She isn't happy with us right now as we are an arms distance from about five different elephants. We wait about 20 minutes on the road, us guests wondering what we are going to do to get out of this. During this time the elephants surround our car but generally acting as if we are not there. It is only the mother who refuses to eat and play with the others. Instead, she just stares at us. At one point, Matt and I, who are in the back seat of the jeep are taking photos of two elephants right in front of us. One elephant starts reaching his trunk out for my camera and I have to back up into the vehicle to save my Nikon. It seriously was crazy how close they are to us. Finally, after about 25 minutes from our initial encounter with them, the road in front of us clears. Our guide explains that this is our chance and to hold on as he is going to gun the car and speed away. He tells us she will probably chase us and if she grabs the car or flips it to stay with the car. Yes, I am close to needing a new change of pants at this point. He guns the car and at first turn, the engine stalls (just our luck) but the second try it roars to life. The huge mama elephant does not like this and begins to charge the car, luckily we speed away and she roars a trumpet blast in return. She takes a couple steps to run, along with a couple other elephants, but thankfully decides it's not worth it and lets us drive off. Up to this point, elephants were my favorite to see in the wild. Such gentle giants who look so slow and loving. Nope, I'm good now. Congrats giraffe, you are my new favorite. A super common question I get is: what camera do I use for my travels. The body is a Nikon D3300 and this is the wide angle lens I use and love - I am seriously obsessed with it. My full guide that includes all the camera gear I take on every trip is here.